Simultaneously connect both serial and Modbus devices to PLCs and/or applications. Or The DeviceMaster UP brings plant floor device visibility by enabling communications between factory floor serial and Modbus devices, and PLC controllers. Taking Modbus connectivity to new heights, Comtrol introduces the DeviceMaster UP 16-Port Modbus gateway. Built on a compact, low-profile housing, it packs both port density and advanced Modbus connectivity features designed to simplify even the most challenging installations. Loaded with the latest Modbus Router firmware, this is the most advanced Modbus gateway on the market today. A highly advanced Modbus gateway with a vast array of Modbus connectivity options - The DeviceMaster UP 16 Modbus is designed to simplify installation and maintenance of even the most complex Modbus applications. DiagnosticsLocal and remote slave device and port specific diagnostic web pages that display status, message response timing, timeout and other error counts, and overall message statistics. A serial log is also included to provide message level diagnosis. Web Page Configuration• Supports Modbus/RTU over Ethernet TCP/IP connections to the corresponding serial port via intelligent Modbus message handling and routing. • Supports only Modbus/RTU over Ethernet TCP/IP connections to a serial port. For Modbus/TCP functionality, please see the DeviceMaster UP. 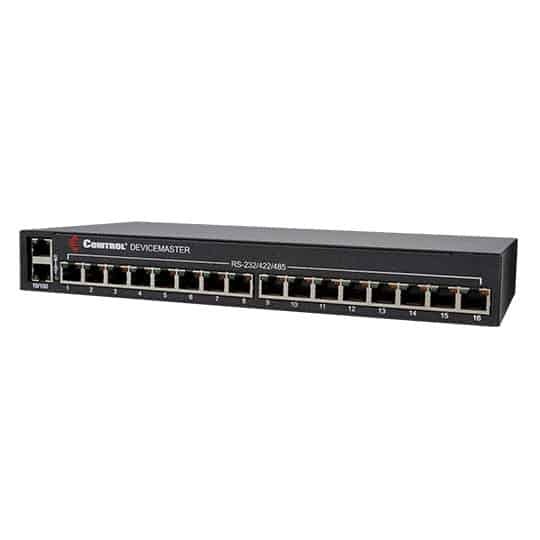 • Supports up to six Ethernet TCP/IP connections to each serial port. Diagnostics• Modbus device specific statistics, response timing, and status. Up to 255 devices per serial port can be monitored simultaneously.